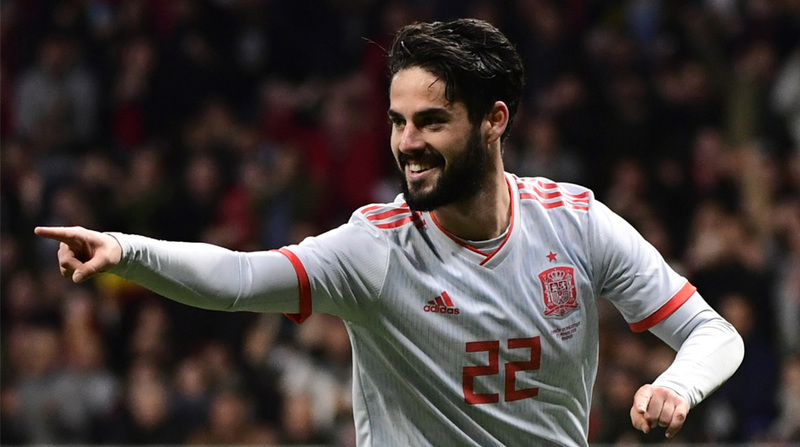 Isco struck a hat-trick as Spain made a statement of intent with the World Cup little over two months away, as La Furia Roja ran riot in their friendly against Argentina by thrashing the South Americans 6-1 at the Wanda Metropolitano. At Atletico Madrid’s swanky new stadium, a glum-looking Lionel Messi watched on from the stands as he was ruled out with a niggling groin injury and it wasn’t long before the hosts would take the lead. Rojiblancos forward Diego Costa opened the scoring in the 12th minute, latching onto Marco Asensio’s through ball and getting clattered by the oncoming Sergio Romero but crucially managed to squirm his shot past the Argentine shot-stopper. It could have easily been 1-0 to Argentina, however, for Gonzalo Higuain, starting at the tip of La Albiceleste’s 4-2-3-1, had missed an absolute sitter a few minutes before Costa’s opener. Spain, as is their wont, were dominating possession but it wasn’t all sideways as Argentina would find out soon after. Real Madrid man Asensio found his club teammate Isco in the box and the 25-year-old first-time finish left a sprawling Willy Caballero no chance whatsoever. Nicolas Otamendi would reduce the deficit with a fine header off a corner late in the first-half to give the visitors hope, but it proved to be a false dawn for the La Furia Roja were imperious in the second-half. After beating Italy 2-0 without Messi on the weekend, Argentina had grown in confidence but their post-interval showing showed how dependent they are on their talisman. Nobody told Spain it was ‘just’ an international friendly for Isco would extend their lead in the 52nd minute after Iago Aspas showed presence of mind to lay it off for his compatriot and Thiago would add a fourth three minutes later with a fierce shot from inside the box. Aspas, on for Costa at the interval, proved too much for the central defensive pairing of Marcos Rojo and Nicolas Otamendi to handle with his incisive running. Spanish custodian David de Gea, of all people, would split the Argentine defence with a punt that found Aspas and the former Liverpool striker didn’t dally and his first-time shot found a way past the onrushing Caballero to further extend Argentina’s misery. There was still time for a sixth and Isco would be the one to score it, smartly finishing a bobbing ball inside the box to register his first-ever treble for the national side. With the win, Julen Lopetgui have sounded a warning to their rivals that they are serious contenders for the big prize in Russia while Argentina clearly have a lot of work to do if they wish to go all the way.